"The Poet of Passion" in Authors' Readings. 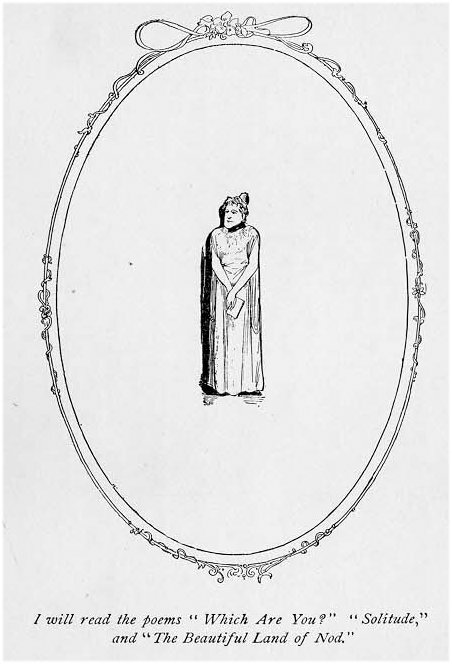 The sketches in this volume showing characteristic attitudes of the authors represented are the illustrator's individual impressions from life. 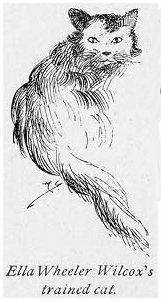 They were made by him from pencil sketches drawn while observing the authors read or recite, or from his recollection of the various poses assumed. Some of the original sketches in lead pencil were made at public readings. Others were made in private. In addition to the many characteristic poses, a large portrait sketch from life, signed by each author, was made. When the question of putting these pictorial observations into book form arose it was found that there was ample material for two books. Under these circumstances those authors were chosen for the present work whose attitudes were entirely completed and whose literary work had already been selected and illustrated. Just two kinds of people; no more, I say. The good are half bad, and the bad are half good. Who puts on vain airs, is not counted a man. Your portion of labor and worry and care? They want full measure of all your pleasure. 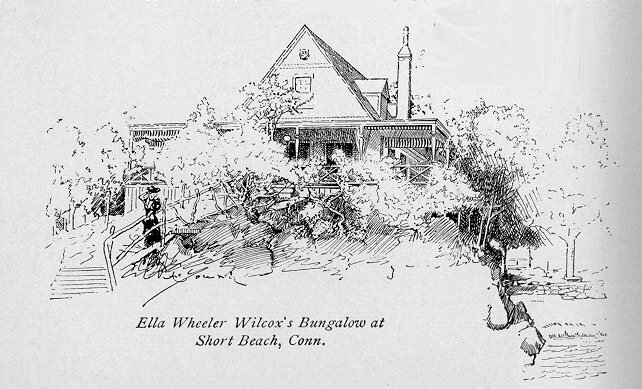 MRS. ELLA WHEELER WILCOX was born in Johnstown Center, Wis. Her parents were emigrants from Vermont to Visconsin in the early days of that State. Her father, who was a descendant from Ethan Allen, was in his younger days a teacher of the violin. In Wisconsin he became a farmer, and it was upon a farm that the first years of Mrs. Wilcox were spent. Soon after she was born the family moved to a farm in the town of Westport, Wis., a few miles from Madison, in the famous "four-lakes district." It was amid the rural scenes of this most beautiful country that she caught the first inspiration of poetry. 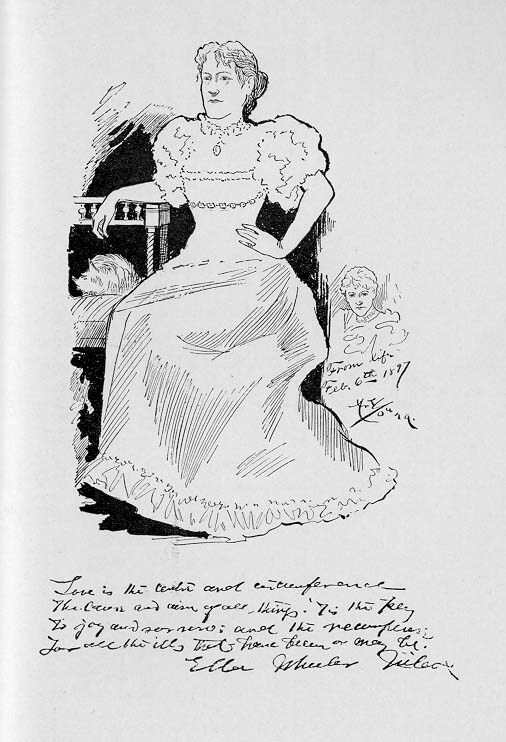 "Minnie Tighthand and Mrs. Dunley, an Eloquent Novel Written by Miss Ella Wheeler." "The following novel is a true story. I suppose the reader will doubt it, but it is true. It is a scene that I witnessed when living in England, and after I came to America I published it. The reader may believe it now." Face white as the snow. She's tall and merry to!" 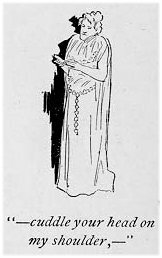 Mrs. Wilcox was then, as she has always been since, an indefatigable worker, often producing several short poems in one day. She had a great desire to see some of her productions in print, and set about, without her parents' knowledge, to have them published. Finally, at the age of fourteen, one of her articles was published in the New York "Mercury." 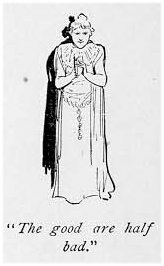 The delighted girl sent for a large number of the issue containing it, and the arrival of the bundle was the first intimation her parents had that their child had "gone into print." 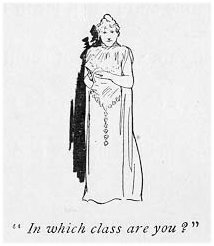 When she was sixteen years old "The Chimney Corner" printed one of her productions and paid her for it. It was the first money she had ever earned. Soon after she became a paid contributor to "Harper's Bazar," "Harper's Weekly," "The Saturday Evening Post," of Philadelphia, Leslie's periodicals and many other publications. The refusal of her works by editors never discouraged her. As soon as a poem or article was returned by one she sent it to another. She had an elaborate system of bookkeeping, keeping scores of productions in the mails all the time. She was particularly anxious to have an article published in the "Atlantic Monthly" and placed that magazine at the top of her list. Finally, after five years of disappointment, she had a poem accepted, and waited three years before seeing it published. Then she got five dollars for it. But it was not many years till she found a ready market for all she produced. Besides her collections of poems she has published several novels and has written much for the newspaper syndicates. Her first volume, "Drops of Water," was published in 1872, and is a collection of verses on the subject of total abstinence. Weep, and you weep alone,"
But has trouble enough of its own.,"
sung themselves into her brain while driving to the Governor's residence. She completed the poem the following morning. In 1884 Miss Wheeler was married to Mr. Robert M. Wilcox, and her home since then has been in the East. She lives in New York City in the winter, and in her summer home at Short Beach, Conn., during the hot months. She has given her seaside cottage a poetic name--"The Bungalow." The poet of passion has many fads, chief among them being her gowns, which she designs herself. 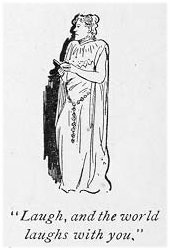 She has an elaborate and costly collection of girdles, and is always on the lookout for unique and handsome ones to add to it. Her fad in animals is fine Persian cats, which she trains to perform. 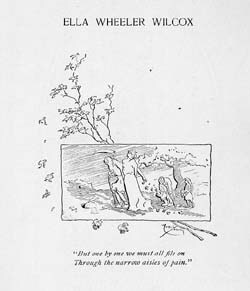 Among Ella Wheeler Wilcox's better known books are "Maurine, and Other Poems," which was first published in 1875, "Poems of Passion," "Poems of Pleasure," "Mal Moulee," a novel, "Men, Women and Emotions" and "Custer and Other Poems." The three poems, "Solitude" and "The Beautiful Land of Nod," from "Poems of Passion," and "Which Are You?" from "Custer and Other Poems," all copyrighted, are reproduced in "Authors' Readings" by permission from both the author and the publishers, W.B.Conkey Company, Chicago.